Two sisters travel to a cheesy tourist trap where they battle toxic monsters dressed in bigfoot costumes in order to save the ones they love. If non-mainstream Horror isn't your thing then go somewhere else as this film wasn't made with you in mind at all. Let me start with the cast - you've got Doug Jones, Kane Hodder, Michael McShane, Shawn Weatherly, a casting that any director making their feature length debut would kill for. Well that's what Matt Jackson got and his other cast members all seemed to up their game, giving us entertaining performances. Talking of Matt Jackson, he does a fantastic job and makes the film flow well without too much stop-start, which is very much helped by Michael Skvarla's great script, another debut for in a feature film. Jackson made a great decision in not relying on the well known names to keep you interested and focuses more on the films story, a risk that works. Now don't get me wrong, this is pure b-movie, with the usual b-movie goodness such as gore, I'm talking over the top gore. Sure the practical effects are pure cheese, but that is nothing bad and if anything adds more charm to the feature. The films humour is placed well throughout and I honestly found myself laughing really loudly, a rarity for me. It doesn't pretend to be anything else and stands proud to be a b-movie, even the cast seemed like they had a great time which I feel makes for better viewing. 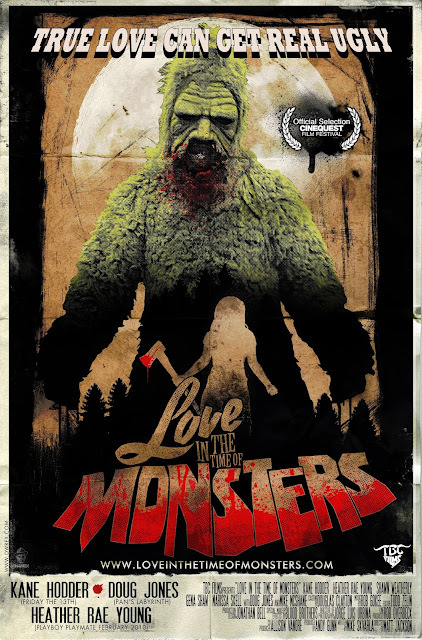 "Love In The Time Of Monsters" is a future cult classic that I just can't wait to get a copy of, be sure to get yours!